showing some of the material supplied from Shaw Lodge Mills, Halifax. BRITAIN'S exhibition train, drawn by the Flying Scotsman and equipped in part by products from Halifax, is to extend its dollar-earning tour of the US to cover parts of the Middle West and the Pacific coast states and major cities in Canada. The train has four special coaches fitted out as mobile exhibition halls for British firms, and there are also Pullman cars, an observation car, an administrative car and a reception car. All the upholstery and certain sections of the carpeting have been supplied by John Holdsworth & Co Ltd, Shaw Lodge Mills, Halifax. The carpets used in the coaches are of a special light-weight material which Holdsworth's normally supplies for aircraft. The two old Pullman cars have been upholstered with materials typical of the time and age of the vehicles - they are about 40 years old. The observation car has been furnished and decorated in modern style. The administration car is divided into first and second-class compartments, with the second in conventional style and the first in ultra-modern. 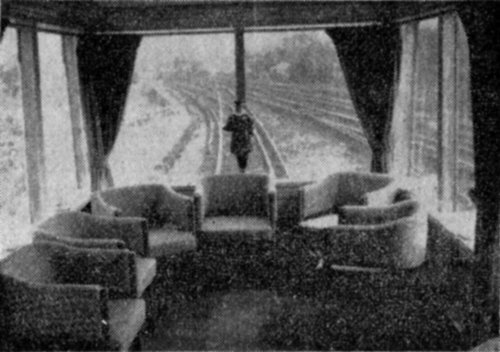 The firm has also supplied curtains used on the train. The export train was originally planned to make a five-week tour mainly of the Eastern United States, covering about 2,200 miles. This tour ended at Houston, Texas, after the train had been visited by more than 100,000 people at New York, Philadelphia, Baltimore, Washington, Dallas and Fort Worth. The new tour of about 8,000 miles is starting from Slaton, Texas, and calling at Los Angeles, San Francisco, and Seattle before crossing into Canada, where calls will be made at Vancouver, Edmonton, Calgary, Regina and Winnipeg. The train will later make a series of visits along the Great Lakes and on both sides of the border before ending the tour at Toledo, Ohio. Commenting on the tour, Mr. G.P.A. Sunderland of John Holdsworth & Co Ltd said thay had received some "very good enquiries - we expect things to develop from the useful contacts obtained."